Saudi Arabia is situated in the Middle East and has coastlines of both the Red Sea and the Persian Gulf. It is the largest country in the Arabian Peninsula. The population of Saudi Arabia is 27 million which includes over 8 million foreign residents. The capital city is Riyadh and it is the birthplace of Islam. 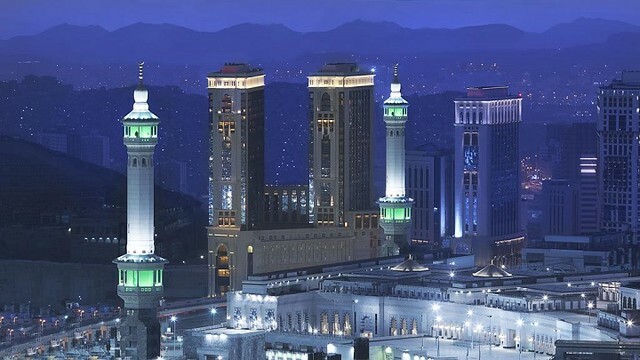 The capital city is filled with skyscrapers along with several mosques, the most sacred being Masjid al-Haram in Mecca. Another famous mosque is found in Medina, notably the Masjid an-Nawabi, where you will find the burial site of Mohammed the Prophet. The geography is diverse with mountain ranges and deserts, as well as grassland and forest areas. Temperatures vary with different regions and can reach more than 100 degrees F during the summer months. In other areas the temperatures can drop to below freezing. The country gets very little rain, about 4” a year. The largest sand desert in the world is the Rub Al-Khali while in the southwest you will find mountain ranges reaching to over 9,000 feet high. The cities are bustling and filled with cultural delights for tourists to see. You will find several magnificent hotels throughout the country, most of them rivaling any five-star hotel in the rest of the world. 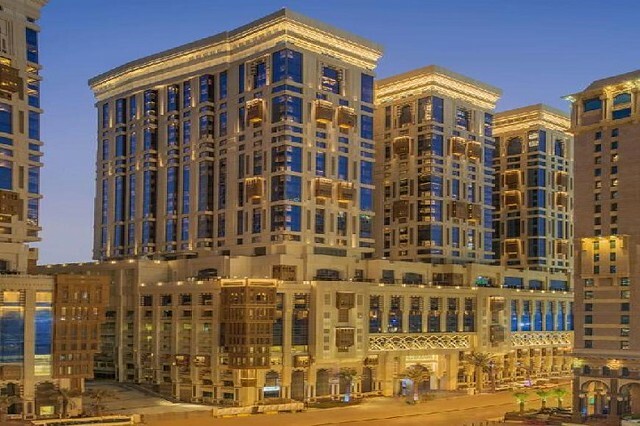 You will find this magnificent hotel in Makkah. 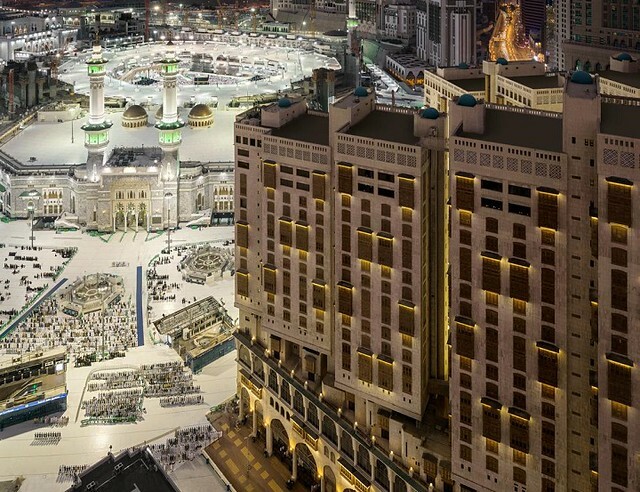 It is conveniently located just a few minutes away from the Haram and offers spectacular views of the Harem. Also within walking distance is the Kaaba, which is a building in the center of the most historic mosque. It is regarded as the most sacred site in Islam. The hotel has 764 rooms and suites, all with amazing views of the city. You will find 3 three restaurants and two lounges to relax in. For fitness buffs, there is a full-service fitness center. For businessmen, there is a 24-hour business center with eight meeting rooms. The hotel offers room service and free high-speed internet. Airport transportation is available on request. You will find this hotel in front of the Holy Haram. This ensures an uninterrupted view of the religious center. Many holy shrines are within walking distance of the hotel. You may see the Jannat Al Moaalah Graveyard as well as the Touwah Wall. The Central Business District is a short taxi ride away. The hotel offers free high-speed internet and room service. There is a restaurant and bar/lounge on-site, with a banquet room for large gatherings. You will find a well-equipped business center and conference facilities with a concierge at hand for any inquiries. Rooms come with mini-bars and are all air-conditioned. Family suites are available as well as non-smoking rooms on request. 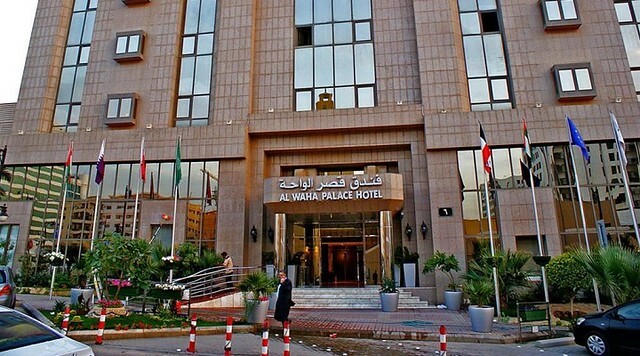 This hotel forms part of the Hyatt chain and is in the heart of the city of Makkah. The hotel offers accommodation to tourists and pilgrims alike and has successfully blended comfort and convenience with elegance. 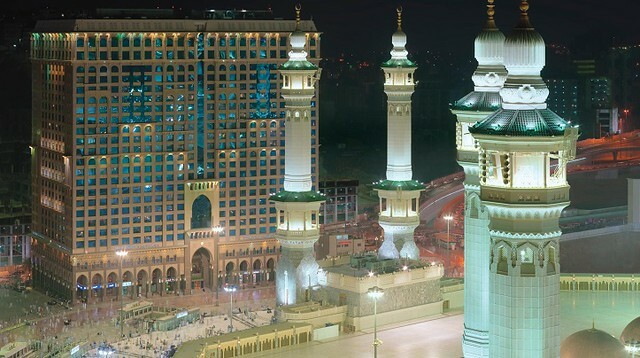 Being just one minute walk from Al-Masjid Al-Haram the hotel is accessible by road and can be easily reached from Jeddah as well as the International Airport. The 656 rooms and suites are all modern, featuring plush beds as well as breath-taking views of the Holy City. For dining, the hotel boasts on-site restaurants and a Tea Lounge where you can relax. Free wi-fi is available in the hotel as well as the use of the 24-hour fitness center. There is a business center which is fully equipped with high-speed internet. All rooms come with a refrigerator and some are available as family suites. There are also non-smoking rooms on request. This hotel is found in Riyadh. The luxury 4-star hotel is situated in the heart of the city. It is surrounded by shopping malls and Government Offices. The International Airport is just 25 minutes from the hotel and the Riyadh Exhibition Centre is within walking distance. For golfers, there is a choice of courses about 1.2 km from the hotel. You will find the rooms decorated in warm shades and the floors carpeted. Every room comes with satellite tv and the bathroom is constructed of marble. The hotel has a fully-equipped fitness center for guests. With 7 floors of rooms and suites, the hotel caters for both businessmen and families alike. High-speed internet is fitted in each room and the hotel has a restaurant and pool on-site. Airport transportation is available. Rooms come with a kitchenette and a mini-bar as well as microwave. Non-smoking rooms are available, as are family rooms. This hotel consists of six towers which reflect the Arabian and Oriental design. The hotel is in a prime position over the Haram Piazza. It is just in front of the King Fahd Gate. All the rooms and suites have stunning views and the hotel offers a wide range of cuisine styles. In the hotel, you will find a shopping mall with all sorts of shops from clothing to electronics. The hotel has free internet and room service. Breakfast is available and there is a concierge on hand should you need to arrange anything. There is a business center on the premises as well as conference facilities. Family rooms come with kitchenettes and non-smoking rooms are available. Saudi Arabia has so much to offer tourists and pilgrims alike. As well as culinary delights, each city offers many historical things to see. If you plan to visit the country, you should consider the time of year you travel as the summers are notoriously hot and uncomfortable. Most hotels will have to air-condition in them, although care should be taken when walking outside in the heat. Dress should be conservative, taking into account that at some time during the year Ramadan takes place. This is in the ninth month of the Islamic Calendar and is observed by Muslims all over the world. Fasting takes place at this time.